Caavo’s new Control Center wants to unify all your TV services and devices into one interface. It wants to be your universal discovery platform too. If you are looking for a way to more-easily control of all the devices under your television, Caavo’s new $99.95 Control Center might fit the bill. The company released the $399 Caavo Classic last year, but the 8-HDMI port unit seemed more appropriate for people with high-end AV system. The lower priced 4-HDMI port Control Center seems aimed at the more mainstream user. 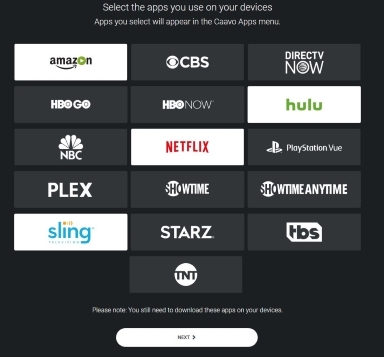 Control Center works with Apple TV, Chromecast, DirecTV, DVD/Blu-ray, DISH, Fire TV, Nintendo®, Nvidia Shield TV, Playstation®, Roku, Spectrum, TiVo, Xbox One, and XFINITY. Control Center, unlike its more expensive big brother, requires a $1.99-a-month subscription. Caavo sent me one of the units three days before the official release. I’ve had a chance to test out some of the functionality, and here’s how the device did. The initial setup mostly went very smoothly. 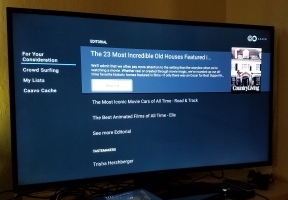 I connected a Fire TV, Samsung Blu-ray player, and Sling TV Air TV Player to Control Center via HDMI, I turned the unit on and it led me through the rest of the setup. Control Center recognized the Fire TV and Blu-ray player and led me through the setup for each. Once complete, I was able to control each device from the Caavo remote. I had to add the details of the AirTV Player manually. The installation told me I would not be able to control Air TV with the unified remote. However, I discovered I was still able to use it to navigate Air TV’s interface and play videos. I do not have pay TV so was unable to test the integration with Dish Network, DirecTV, Xfinity, or Spectrum. somewhat accented English. I was able to switch apps and devices and play and pause videos. I was not able to control my viewing inside of Sling TV with my voice. The system seemed to recognize my request to change channel correctly but couldn’t execute it. Caavo also integrates with Google Assistant and Alexa. I tried Google Assistant. Once I linked Caavo through the Google Home app, I was able to start playing a show or search for content by genre. It took a while to remember how to talk to Control Center through Google Assistant. Requests need to be in the form “Hey, Google. Ask Caavo to…”. However, once I got the hang of it, the functionality worked well. Discovery is one of the most interesting aspects of Caavo. Figuring out where to find a show or movie across different devices and services can be a big problem for consumers. Using Control Center fixes this problem for content in mainstream services like Netflix, Amazon, and Hulu. However, there are some big gaps in its abilities. One problem I found was that Caavo did not know I subscribe to HBO through Sling TV. Searches for Game of Thrones offered me the opportunity to sign-up for HBO Now, but not to watch with Sling TV using my subscription. Control Center directly supports 16 online video services today. It also returns some web resources that match search queries. 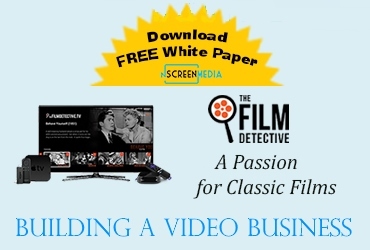 However, if you regularly use one of the 200+ SVOD services not directly supported, it does not provide any discovery or search assistance. Control Center provides a “Watch” menu item which it says provides “editorial guides, alerts for new episodes of your shows, and hand-picked suggestions from tastemakers to discover something interesting to watch.” I glanced at this feature but found nothing of great interest to me. Hopefully, the listing here will improve over time. Who is best suited to use Control Center? Only use mainstream streaming services like Netflix and Hulu.